Big Bend has inspired authors for centuries. The magnificent landscapes and peaceful atmosphere make for a wonderful story setting. Most of the following are written by local authors and bloggers with more content to come. Follow our posts to read some of this work here. Celebrate the 4th in Big Bend country! Have fun at the 4th of July parades in Marathon and Terlingua! Marathon, Texas West Fest Cabrito Cook Off brings competitive cooking and crafts to Post Park to raise funds for Marathon Volunteer Fire Department each year! Come to Big Bend for great night skies! Marathon’s New Moon Fest celebrates dark starry nights with educational talks, star parties, tacos, music, and more! 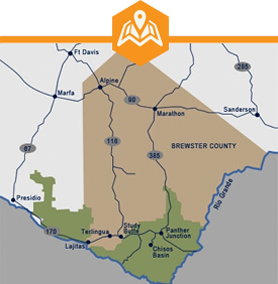 Post Park is a wellspring in the Big Bend region. Enjoy a picnic under shade trees near a spring-fed pond at this beautiful park the next time you’re in Marathon! In Big Bend, you’ll find wildlife crossing the land, birds and bats flying high above, constellation critters dotting the night sky, and fossil creatures buried deep below! Enjoy Big Bend wildlife on your next visit! From spectacular stargazing to amazing sunset horseback rides, these are the top reasons you need to experience Big Bend’s magical summer evenings. One family fulfills a longtime dream of backcountry camping in Big Bend National Park! A visit to Big Bend during the summer time can cast a hot spell on visitors! You’ll want to keep coming back if you consider these tips for travel! Follow Ann on a 5-day roundtrip to Big Bend from Houston, Texas, where she shares great photo stops and a time table for visiting some of Big Bend National Park’s top sights. Paul and Marsha Weaver documented their stay in the Big Bend in many blog posts. Here, they share wonderful views and insights from Pinnacles Trail in Big Bend National park.